You are cordially invitation to attend the unveiling of a memorial plaque for František Binder who served as an air-gunner with 311 Sqn. 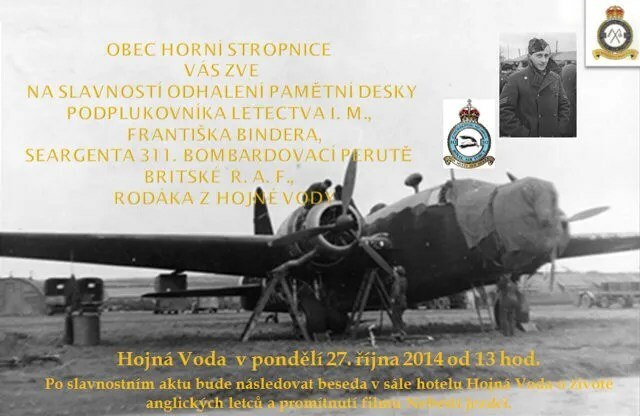 The ceremony will be at Hojná Voda on Monday 27 October 2014 at 13:00. 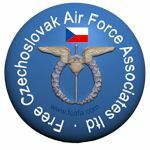 After the ceremony there will be a presentation will be held in the hall of Hotel Hojná Voda about the Czechoslovaks who were in the RAF. The presentation will be followed with the showing of the film Nebeští jezdci. Last year I visited the cemetery of Czech graves at East Wretham churchyard including that of Frantisek Binder. 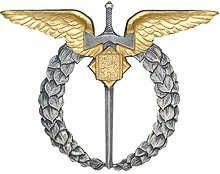 My father was Josef Horacek a pilot with the 311 squadron and was a part of the burial party for Frantisek Binder. To all their memories. Salute. Moc mne potěšilo Vaše oznámení o pamětní desce dalšímu čs letci, který byl příslušníkem 311. Přeji Vám, at se celá akce vydaří. S díky a pozdravem všem kteří se na realizaci podíleli.